Sainsbury/ ASDA agreed a merger which will see US Walmart hold 42% of the enlarged group. April 2018 saw a sharp rebound in UK blue chips which added c. 450 points due to M&A activity, higher commodity prices and declining UK gilt yields. Glencore had a busy month with CEO Ivan Glasenberg resigning from Rusal following the US move to impose sanctions. Glencore was then sued for $2.95bn by Dan Gertler and freezing orders have been put in place on two of its DRC copper mines. Takeda Pharmaceuticals fifth proposal to acquire Shire Pharmaceuticals got a tentative nod from the Shire board. The terms are 0.839x Takeda and $30.33 in cash per Shire share. President Macron admitted that his visit to Washington to persuade US President Donald Trump to keep to the Iran nuclear deal “probably failed”. Hammerson rejected a revised takeover proposal from Klepierre at 635p per share but facing increasing shareholder opposition then changed its mind on the merger with rival Intu Properties. Barclays reported Q1 loss of £236m with TNAV declining to 251p from 276p. CEO Jes Staley promised to increase shareholder returns via a share buyback, but did not provide further details. UK blue chips bounced 452 points during April on the back of higher commodities, lower sterling and expectations that the Bank of England is dialing back on its rate rise agenda. Speaking at the IMF meeting in Washington Governor Mark Carney suggested that the MPC could wait longer. Saudi Arabia’s apparent intention to keep crude oil above $70/ barrel, the prospect of new sanctions on Iran which could remove 800k barrels of Iranian crude from the global market and strong global GDP growth have kept Brent underpinned, boosting UK oil majors and oil services. M&A is a major feature in 2018 with deals being rushed through whilst sterling remains cheap. But not all M&A gets to the finish line, if anything it has become harder to complete. And it is taking longer these days to get completion. Tokyo investors are concerned about Takeda Pharmaceuticals whose new CEO, Frenchman Christophe Weber is hell bent on acquiring Shire Pharmaceuticals following on from recent bolt on acquisitions. The Shire merger, if completed, will see Takeda shouldering a debt of c. US$40bn has caused a significant sell off in Takeda’s shares. Takeda is taking significant risks, especially if the Trump Administration pursues pharmaceutical price cuts, which would hit the pricing of Shire’s expensive rare drugs. 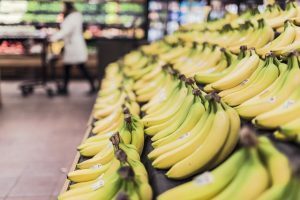 The proposed merger has left many analysts scratching their heads as to its merits, as there do not appear to be significant synergies or overlap. Weber still has to get his shareholders onboard, and arrange financing. The whole process has shown Takeda is desperate to buy Shire. French tycoon, Vincent Bollore has hit back against allegations that he undercharged the presidents of Guinea and Togo for advertising on their election campaigns as an incentive to award Bollore Group port concessions. Bollore claimed that the claims were rooted in prejudice against African leaders. 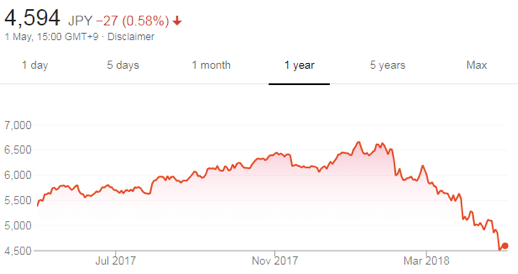 Bollore SA shares dropped from highs of €4.50 on April 19th 2018 to €4.12 on concern that the corruption probe might uncover wrongdoing in its lucrative port and oil storage operations in west Africa. There may also be executive changes. 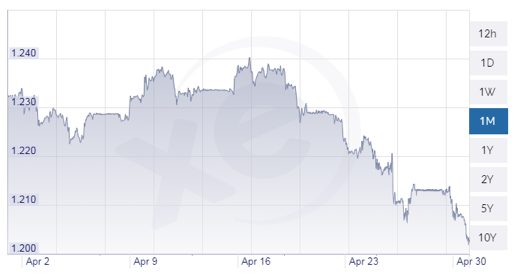 The Euro declined noticeably vs. the USD over April reversing from highs of $1.24 to just above $1.20. The US Q1 season started with high expectations, consensus for the S&P 500 was a 24.6% rise in earnings, according to Reuters. Excluding the energy sector the Q1 earnings growth estimate was around 22.8%. These were very high forecasts. Of the 274 / 500 US companies that have so far reported, 79.2% have reported earnings above estimates (above the long term average of 64%) whilst average revenue growth has been 8.1%. Q1 earnings growth has been helped by cuts in corporation tax but this is part of the 2018 story. Robust global growth is also important. The US market is skewed with the top ten technology companies expected to reach $1trn in revenues in 2018. Recent moves in the “market cap wars” has seen movie streaming giant Netflix (NASDAQ: NFLX) market cap reach $136.5bn just above IBM (NYSE: IBM) at $133.75bn. Facebook market cap at $500bn exceeds both Exxon Mobil ($342bn) and Walt Disney ($152bn). Sign of the times? Philip Morris fell after Q1 tobacco shipments declined 5.3% meaning revenues were $103m behind forecasts of $7.03bn. Smokers have proved slow to move to “next generation” vaping and heated tobacco products.